Chelsea qualify for last 16 of champions league with superb 2-0 win over Isreali side Maccabi Tel Aviv. Chelsea scored the opening goal through Gary Cahill in 20th minute and Tal Ven Haim’s red card just before the break pretty much kill the game off as Chelsea added another through Willian in second half. Watch match Highlights right here on this page. Chelsea can book their place in the champions league knockout stages if they can get a win against Maccabi Tel Aviv on tuesday night 24th November 2015. A win will not only sure qualification to next round it will also keep Chelsea’s hopes of finishing top of the group by staying in touch with FC Porto who they will play on the last matchday next month. Jose Mourinho side will play Maccabi Tel Aviv tonight at around 20:45 CET / 19:45 uk time and BT Sports will broadcast the game live in United Kingdom. Match Preview & Team News: Israeli side Maccabi Tel Aviv has not chance of qualification to next round but they will be motivated to host a top european nation at home ground. Chelsea will be slightly more confident going into the game after their decent 1-0 win against Norwich City over the weekend and they don’t have any fresh injury worries with only Thibaut Courtois and Falcao missing through injuries. Since Chelsea still need qualification to next round we can expect Mourinho to field a strong side with the likes Diego Costa, Hazard, Willian and Pedro starting for the blues. Namanja Matic and Cesc Fabregas should start in central midfield roles. 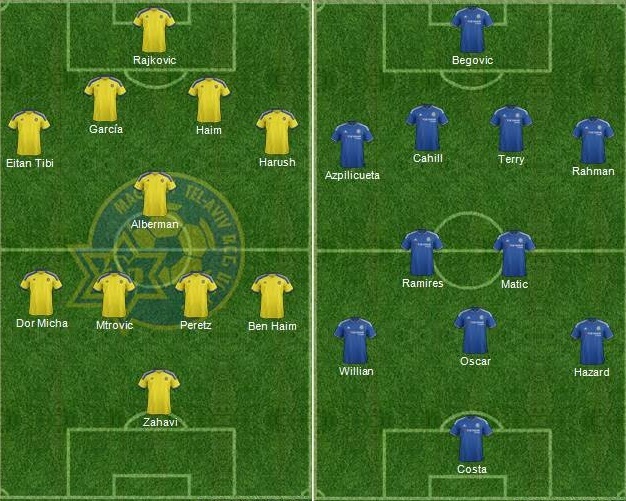 Zahavi will be leading Maccabi Tel Aviv attacking with Rikan and Igiebor providing support in attacking roles. We can also expect former Bolton and Chelsea defender Tel Ben Haim to start in central defence role alongside Tibi. This is how I expect both teams to lineup. Chelsea’s league form has been terrible this season but they started the 2015-16 Champions League season with impressive 4-0 win over Tel Aviv on the first matchday of the group stage. Willian, Costa, Fabregas and Oscar were on the score-sheet with Hazard missing 6th minute penalty.